Say hello to your new favorite appetizer, the Moroccan Dip Platter. Happiest Monday everyone! I’m excited for a new week, Easter, and the start of April on Sunday! March has flown by, but I think I’m ready for a new month. Our weather here in Colorado has been all over place and I’m hoping April brings even more sunshine and zero snow. It’s wishful thinking, but hey, it’s all about staying positive right? 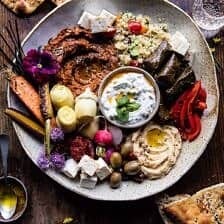 Anyway, I am excited to be sharing this fun Moroccan Dip Platter with you guys. I’ve only been waiting a week or so to share it, but my excitement about this platter is pretty much through the roof. 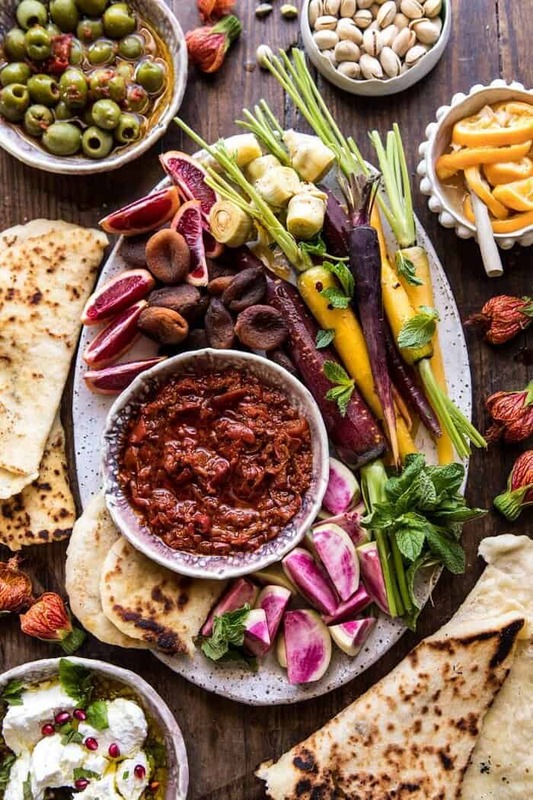 You guys know how much I love a good cheese board, well, I think I love this Moroccan dip platter just as much, if not more. It’s quick, easy, colorful, loaded with veggies, fruits, and even a little goat cheese too. 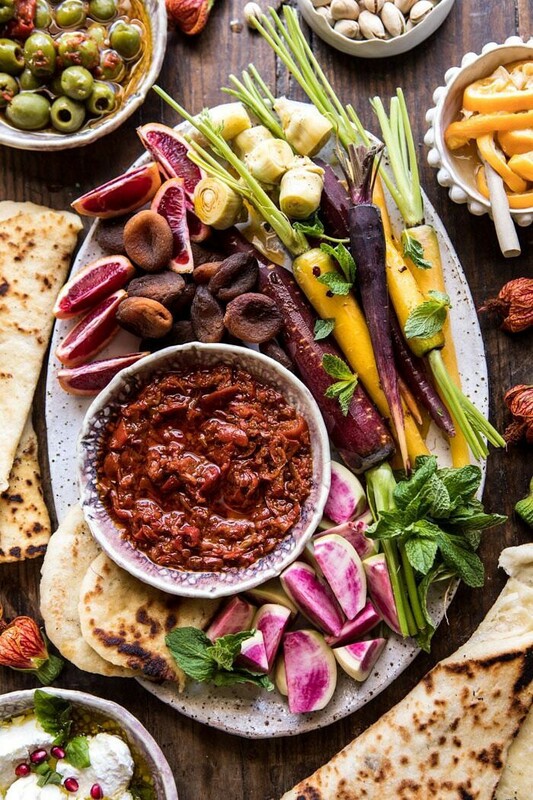 It’s basically the Moroccan…ish version of a cheese board. 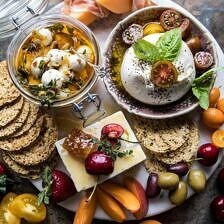 With Easter coming up on Sunday, I wanted to share an easy appetizer that you can literally pick up all the ingredients from the store, and then quickly assemble before guests arrive. I totally get that entertaining can be crazy and stressful, so I want to help make it fun and easy. And this platter is here to step in as your new go-to when it comes to spring and even summer entertaining. 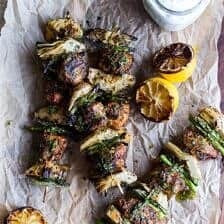 If you’ve been following along on HBH for a while now, then you probably know I love Moroccan flavors and have shared quite a few Moroccan inspired recipes over the years. I blame this love of Moroccan cuisine on my brother Brendan and his girlfriend Lyndsie, who have traveled together to Morocco several times and brought back with them the many, many recipes that I need to be making. Their list is a mile long, so I am slowing cracking away at it, recipe by recipe. When I first had the idea to create this platter, I knew it had to include my favorite condiment of the moment, Harissa. If you guys are new to Harissa, it’s a spicy red pepper sauce commonly used in Moroccan cooking, or served as a dip with naan. You can also buy harissa seasoning (which is SO delicious on chicken) and harissa paste, but today’s recipe uses harissa sauce. I have homemade recipes for both red harissa and green harissa, which if you have the time I highly recommend making. If not, this is the red harissa I buy most often. They also have a green harissa that I love too. 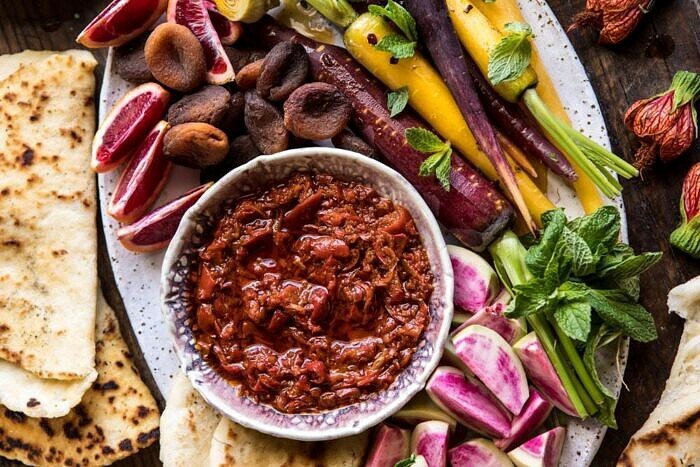 Once you have the Harissa taken care of, the rest of the platter comes together within minutes. Find some really good spicy green olives, plenty of veggies, fruits, and nuts. Then add a little marinated goat cheese and fresh naan, and your platter is complete. What’s great about this platter is that you can make as little or as much of it as you want. If you have time, make homemade harissa and homemade naan, if not, no big deal. Grab your ingredients at the store, plate it up all pretty, and serve. Either way you do it, you and your guests will love this platter. The major bonus is that unlike a lot of appetizer platters, this one is truly on the healthier side. 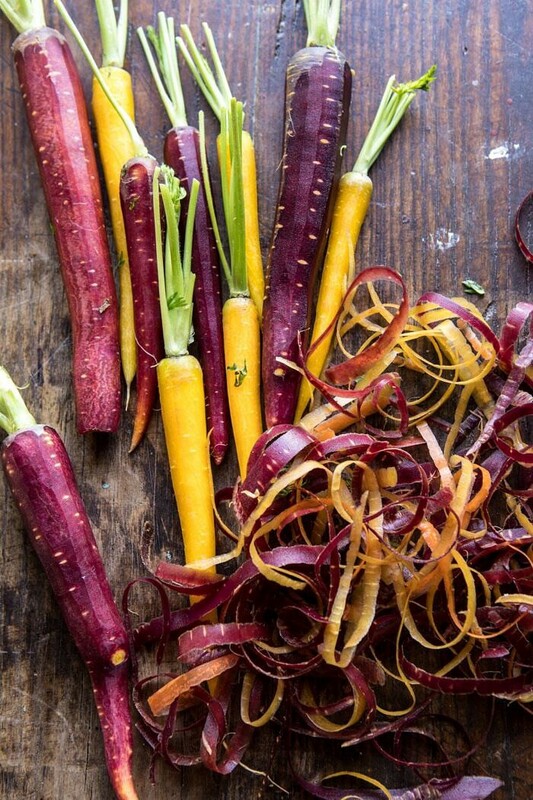 Instead of being loaded with cheese and meats, it’s loaded with veggie based dips, heart healthy olives, nuts, and plenty of fresh carrots, radishes, artichokes, and fruit. And the goat cheese? Well, let’s just be real, we all know that goat cheese is the “healthy” cheese. It is, it is. SO…for those of you celebrating Easter this Sunday, have I convinced you to make this platter for your gathering?! Quick, easy, colorful, loaded with veggies, fruits, and even a little goat cheese too. 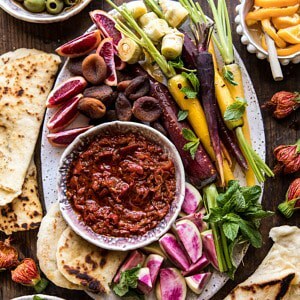 It's basically the Moroccan...ish version of a cheese board and I could not love it more! 1. 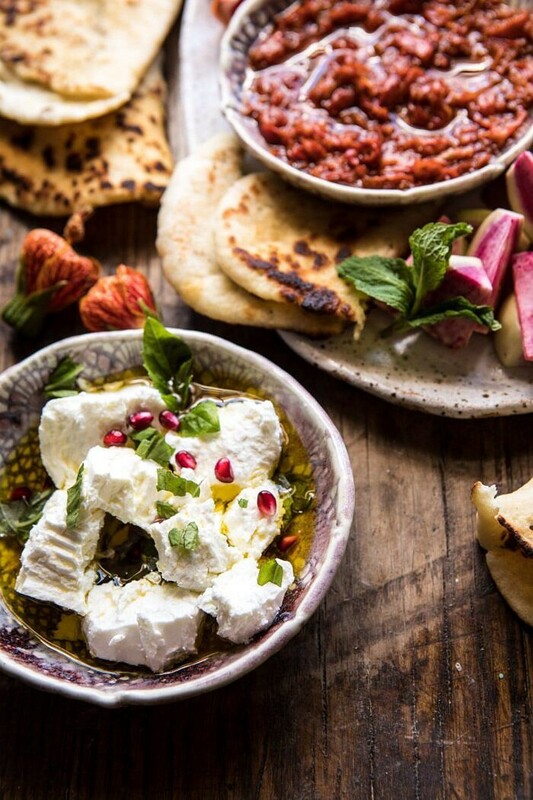 Arrange the harissa, goat cheese, and olives on a large platter. 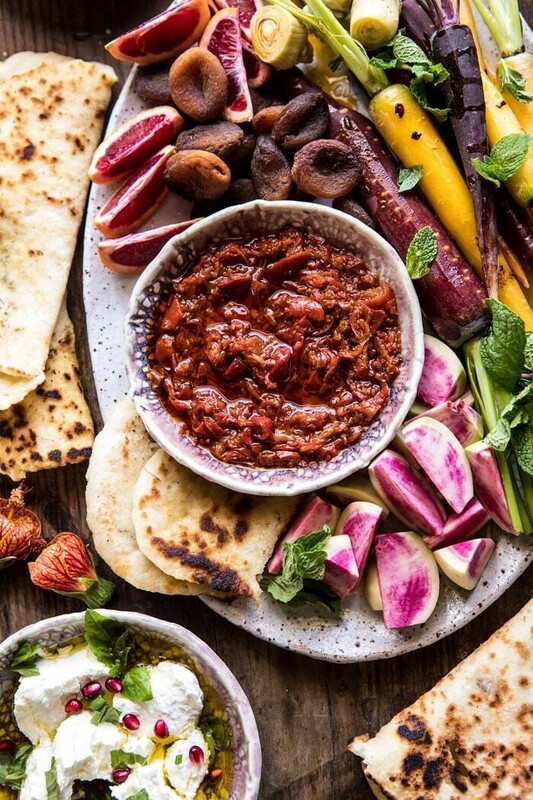 Arrange the remaining fruits, veggies, herbs, nuts, and naan around the dips. Serve. Cut the goat cheese into rounds and place in an 8x8 inch baking dish. Sprinkle with herbs and red pepper fakes. Pour olive oil over top, mostly submerging the goat cheese. Let sit 1 hour or up to 2 days in the fridge. Bring to room temperature before serving. Sprinkle with pomegranate arils, if desired. Hoping so because it’s one of my favorites. oh my, this looks sooooo good!! 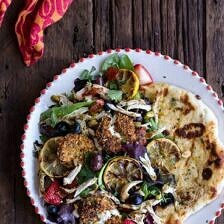 can’t wait for the warmer weather so I can indulge in stuff like this! Yes!! I am so glad you like this Ruth! Thank you! Woo!! Happy to hear that! Thanks Liz! The platter looks amazing. Some great ideas I can use for my next dinner party. Tieghan, this looks amazing! I’m always looking for healthier options for entertaining. Your presentation and photography is always the best. Add to that your fun family stories and sweet personality, and I find your blog to be a real day brightened. Thank you for sharing all of this with all of us. Thank you so much Carolynn! I am so glad you enjoy my blog and posts! I want to dive right into that dip! Sounds so good! Perfect for my next cocktail party! I love everything on the platter! What a gorgeous platter Tieghan! I’ll need to make this for my next cocktail party! Haha of course not!! I hope you love this Jennifer! Your platters are the absolute best – this is gorgeous!! are all these recent recipes in your cookbook? I just ordered it and I am so excited. Hi Amy! The recipes on my blog are different from the ones in the book! I hope you love it, let me know what you make! This is going into my summer recipes.malays looking for something different for appetizers. This is impressive (and easy). Thank you thank you! Perfect! I hope you love this Antri! Through the roof indeed! After a long day repairing roofs (no kidding), this is exactly the kind of meal I love. I marinated both goat & feta cheeses, and had everything cut and ready to go for when I got home. Cream cheese is another cheesey option – no need to marinate it & it goes with everything. I could eat this every day. Thanks so much for another delicious post. I am so glad you loved this! Thank you Mary!